Collection of The Robert M. Minkoff Foundation, Ltd.
Beauty Beyond Nature presents more than 70 of Paul Stankard’s intricately flame-worked still-life sculptures encased in clear crystal from the Robert M. Minkoff Collection. 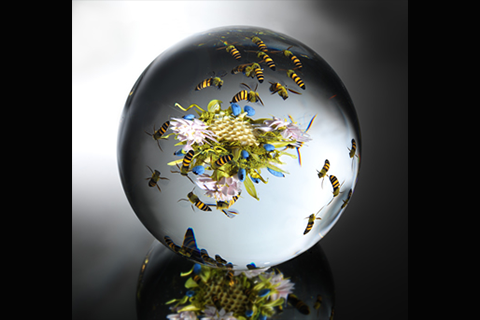 The collection spans more than 40 years of Stankard’s career, from his earliest attempts at paperweights in 1969 to a monumental eight-inch Honeybee Swarm Orb commissioned for this exhibition in 2010. With meticulous technical skill, Stankard creates a variety of flora, insects, figurative elements and poetry that demonstrate his acute powers of observation and artistic sense. He references the plant kingdom as his primary inspiration but does not purport to create scientifically accurate representations of individual species. Included in the exhibition are works representing all of Stankard’s design series beginning with his floral Paperweights inspired by the Victorian-age French botanical paperweights of Baccarat, St. Louis, and Clichy. Unsatisfied with the limitations of the form, Stankard expanded his efforts into his Botanicals series. These forms are perpendicular in orientation, providing a multitude of viewing angles. In these pieces, Stankard incorporates a distinct horizon line separating the upper and lower ground elements of the floral arrangements and also introducing honey bees and mystical root people that live “hidden” in the root structure. He also began to add small words, such as “seed,” “pollen” and “decay” that suggest the life cycle of all growing things. Beauty Beyond Nature: The Glass Art of Paul Stankard has been organized by Museum of Glass, Tacoma, WA and The Robert M. Minkoff Foundation, Ltd. The presentation of Beauty Beyond Nature: The Glass Art of Paul Stankard at the Lowe Art Museum is funded in part by FUNDING ARTS NETWORK, INC.
A new full-color catalog accompanies the Beauty Beyond Nature exhibition and provides context and interpretation through an in-depth essay by critic William Warmus and an artist interview by Glass Quarterly editor Andrew Page. The catalog features high-magnification photographs that reveal new levels of detail of Stankard’s work.